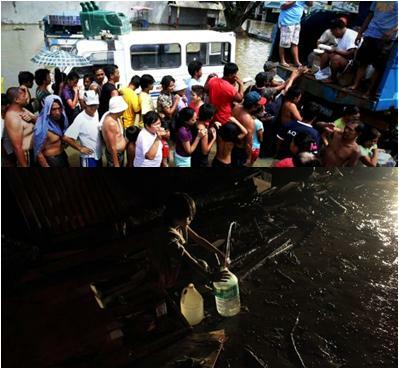 The Department of Foreign Affairs (DFA) said today that messages of sympathy and offers of assistance from foreign governments and international organizations have been pouring in for the victims of Typhoon Sendong, which hit parts of Visayas and Mindanao last December 16.
International Organizations. Messages of sympathy were sent by World Health Organization (WHO) Regional Director Shin Young-Soo and International Organization for Migration (IOM) Director General William Swing. The IOM also has an initial appeal of US$50,000, and that their Philippine office has a team who conducted needs assessment in Mindanao and is providing relief support. European Commission President Jose Manuel Barroso has sent a message of sympathy, and the Philippine Mission to the European Union in Brussels has been informed by the EU that the latter is in the process of requesting funds for relevant humanitarian operations to help those affected by the typhoon, which will be channeled through humanitarian agencies. Humanitarian experts are already on the ground conducting needs assessment, which will be the basis of the funding decision. The EU Humanitarian Aid & Civil Protection is also considering giving in €3 million worth of assistance. Regional Organizations. League of Arab States Secretary General Nabil Elaraby has sent a message of sympathy. Singaporean Acting President JY Pillay and Acting Prime Minister Teo Chee Hean have sent messages of sympathy. It will send 50,000 Singaporean dollars (SGD) through the Red Cross, and Singapore NGO mercy will send 1,000 relief packs worth SGD27,800 through the National Disaster and Risk Reduction and Management Council (NDRMMC). The Indonesian Government has offered a search and rescue and medical team to come in and help in rescue and relief operations. Indonesian Embassy in the Philippine Deputy Chief of Mission Sritomo Wirodijardko sent a message of sympathy, and has turned over a cash donation of US$10,000 and two boxes of goods to Foreign Affairs Undersecretary Rafael Seguis on December 21. The cash and goods donations was turned over by the DFA to the NDRMMC and the Department of Social Welfare and Development (DSWD) today. Foreign Minister Dato' Sri Anifah Aman have also turned over a donation of US$100,000 to Philippine Ambassador to Malaysia J. Eduardo Malaya in ceremonies held on December 21. The Malaysian Embassy in the Philippines have also pledged donations in cash and in kind. Thai King Bhumibol Adulyadej and Queen Sirikit have also sent messages of sympathy. China has offered US$1 million in assistance, with its Embassy in the Philippines already giving US$10,000 worth of assistance. Japanese Foreign Minister Koichiro Gemba has sent a message of sympathy. The Japanese government will provide emergency relief goods worth ¥25 million (PhP14 million) in the form of water tanks and generators, and has offered any necessary assistance. Republic of Korea (ROK) President Lee Myung-bak has conveyed his message of sympathy, through ROK Ambassador to the Philippines Hye Min Lee, and will provide US$500,000 worth of relief items. Australia will provide assistance worth A$1 million based on the needs assessment to be conducted by the United Nations Office for the Coordination of Humanitarian Affairs (UN OCHA) and in kind assistance of worth A$300,000. French President Nicholas Sarkozy, Russian President Dmitry Medvedev, Turkish President Abdullah Gul and Prime Minister Recep Tayyip Erdogan, Italian President Giorgio Napolitano and United Kingdom Foreign and Commonwealth Office Minister of State Jeremy Brown have all sent messages of sympathy. Spanish King Juan Carlos and Queen Sofia, Acting President Jose Luis Rodriguez Zapatero and Minister of Foreign Affairs and Cooperation Trinidad Jimenez Garcia-Herrera all sent messages of sympathy. The Spanish Cooperation Agency for Internation Development (AECID) has set aside €200,000 for humanitarian assistance, and AECID officials in Manila has joined the needs assessment team organized by the NDRMMC, the OCD and the UN Humanitarian Country Team. 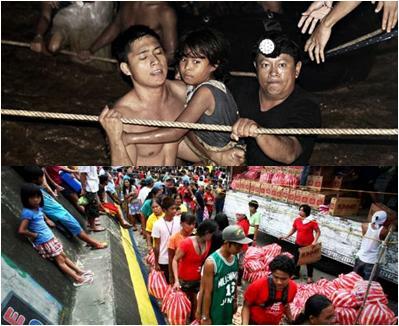 It will also channel humanitarian aid from Spanish non-governmental organizations (NGOs) to help typhoon victims. The German government, through the German Embassy in the Philippines, meanwhile pledged 500,000 euros (roughly P30 million) to help Sendong victims. The Swiss government has informed the Philippine Embassy in Berne that Swiss experts are in close contact with its Embassy in the Philippines as to how they can offer assistance. The Irish government has made available €100,000 to humanitarian agency Plan Ireland for relief efforts in Mindanao and it has also offered emergency supplies. Canadian Foreign Minister John Baird and Parlimentary Secretary to the Minister of Foreign Affairs and Minister of Parliament for Mississauga-Erlindale have all sent messages of sympathy. The Philippine Embassy in Ottawa was also informed by Canadian Defense Forces Chief of Defense Staff General Walt Natynczyk that they will consider any request from Philippine defense officials for assistance, including military assets in the rescue and relief efforts. United States President Barack Obama and Secretary of State Hillary Clinton have sent messages of sympathy, and the U.S. government has offered assistance. The Israeli Embassy in the Philippines and South African President Jacob Gedleyihlekisa Zuma sent message of sympathy. As of the recent report by the NDRMMC, Sendong has claimed 1,010 lives, injured 1,603, 51 missing, and has damaged property worth P999,946,415.